National Assembly Chairman Nguyen Phu Trong hailed the agriculture-based province of Long An in the Mekong delta for setting a bold target of becoming an industrialised one by 2020. The NA Chairman made the compliment during his working session with Long An Province’s authorities on July 11 to review its socio-economic performance as well as preparations for Party congresses at all levels. He noted that the locality, while still based largely on agriculture, has made drastic moves to steer its economic structure to industries to realise it set goal. 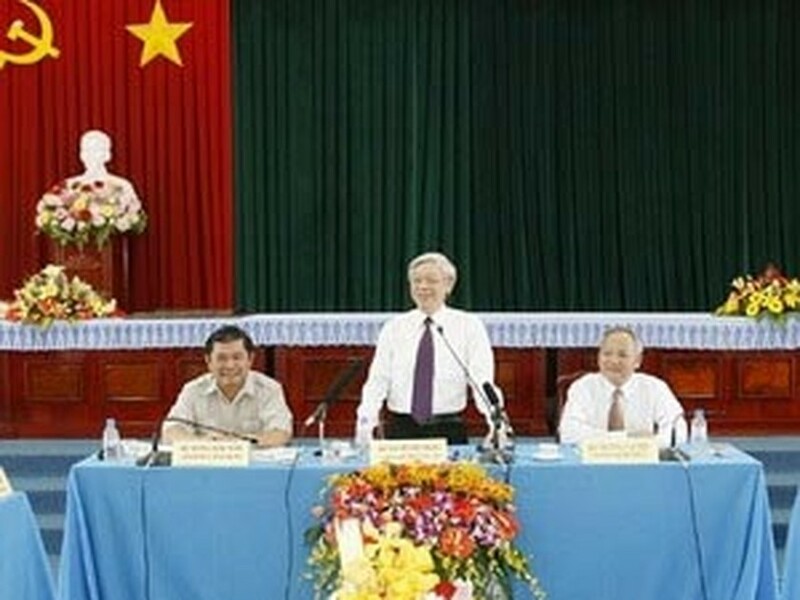 Chairman Trong was delighted that while allocating part of its farming land for industries, Long An has still managed to record a food output of about 2 million tons a year, ensuring that each person will have an increase in food supply on average. He shared with Long An difficulties it is facing, such as a lack of investment capital and electricity for production and daily use, explaining that these problems are common during the development process. Discussing the locality’s preparations for the ogranisation of Party congresses at all levels, the NA Chairman asked Long An to focus on reviewing the implementation of the Party’s major guidelines and policies. He laid special stress on assessing of the locality’s 20 years of implementation of the 1991 Platform, 25 years of carrying out the renewal process, and 10 years of executing the 2001-2010 socio-economic development strategy. By doing so, Long An can formulate strategic orientations and visions for its development course in the following phases and draw interesting lessons and experiences to contribute to the Party Central Committee, Chairman Trong said. He suggested that apart from making careful preparations in terms of personnel, Long An should pay special attention to the compilation of documents, mobilising all Party members and people from all walks of life to the work. According Secretary of the Long An Provincial Party’ Committee Truong Van Tiep, Long An posted an average GDP growth rate of 11.6 percent in the 2006-2010 period. By the end of this year, the local economy will have a structure that encompasses 37.5 percent coming from agriculture, forestry and fisheries, 33 percent from industrial sector and construction, and 29.5 percent from services. This year, the province’s per capita income is estimated to be VND22.3 million. In the first half of this year, Long An has been invested by 6,150 local businesses with a combined registered capital of VND185 trillion and housed 323 foreign invested projects with a total capital of US$3.19 billion. At present, the locality has 23 industrial zones and 41 industrial clusters covering 15,500 ha in total. The provincial party official also reported that 865 out of 871 party cells in Long An have to date held congresses and the province is urgently making final preparations for its ninth party congress.